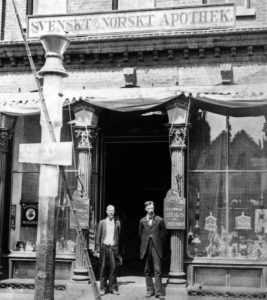 Come to the Goodhue County History Center to view the traveling exhibit, New Land, New Life: Norwegian Immigration in Minnesota, 1825-1925, on view through April 1. Learn the stories behind one of the earliest and largest ethnic groups to settle in Minnesota through this 20 panel exhibit created by the Ramsey County Historical Society and the St. Paul Sons of Norway Synnove-Nordkap Lodge. Funding to create this exhibit came from the Sons of Norway Foundation and funds from the Arts & Cultural Heritage Fund as administered by the Minnesota Historical Society. Through primary materials and secondary research conducted by historians Carlton Qualey and Jon Gjerde, each panel explores the first 100 years of Norwegian immigration. One in five Minnesotans claim Norwegian ancestry. Tuesday – Friday: 9 a.m. – 5 p.m.
Saturday: 9 a.m. – 3 p.m.
Closed on Sunday, Monday, & major holidays. Goodhue County Historical Society Will Be Closed Today Due to Weather.